Varicose VeinsThese are the swollen or stretched veins that protrude from the skin like small sections of rope. Normally, veins direct oxygen-poor blood back to the heart and lungs to become oxygen enriched. Healthy veins function as one-way valves that keep the blood moving in the right direction. Sometimes a vein may become incompetent, allowing blood to leak back down, away from the heart and lungs, and pool in the leg. 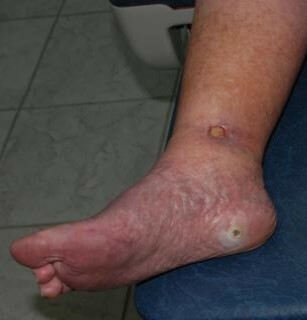 This ìVaricose Veinî becomes enlarged, causing congestion within the vein. This congestion can result in fatigue, swelling, throbbing, heaviness, aching, restlessness in the legs, cramping at night, and itching and burning of the skin. In advanced cases, these problems can lead to skin rash, pigmentation changes, inflammation, ulceration, and bleeding. Reticular VeinsThese are somewhat smaller than varicose veins and their function is to carry blood to the capillaries in your skin, rather than back to the heart and lungs for oxygen. They have thin walls that expand under excessive pressure. Though they are large enough to be unsightly, they are not technically classified as ìvaricoseî veins. Spider VeinsThose annoying, unattractive spider veins, which appear as small red, blue or purple lines, are actually enlarged capillaries. Usually less than 2 millimeters in diameter, they are sometimes raised from the surface of your skin. The most common problems for patients with spider veins are the presence of purplish or reddish lines or web-like discolorations. Pain in the legs, throbbing, itching, cramping, and restlessness of the leg may occur but are not common. Causes of Varicose and Spider VeinsOver 80 million people have problems with varicose veins and spider veins. These conditions are often hereditary. Hormonal factors such as puberty, pregnancy and menopause, and the use of birth control pills containing estrogen or progesterone also affect veins. Age, leg injury, obesity, lack of exercise, weight fluctuation, constriction, and prolonged sitting and standing can be additional contributing factors. Endovenous Laser - Venacure TreatmentEndovenous Laser - Venacure Treatment is a minimally invasive office based treatment alternative for surgical stripping of the great saphenous vein. A small laser fiber is utilized to close the vein. Once the fiber is positioned correctly and the area around the area is anesthetized, te laser treatment is started. In approximately three minutes, the laser energy heats and seals the vein closed. After the treatment, the patient is immediately ambulatory and ready to resume normal activities. This procedure is performed at Deak Vein NJ Clinic. Radiofrequency Occlusion - Closure ProcedureThe Closure Procedure is a minimally invasive ambulatory surgery treatment alternative to surgical stripping of the great saphenous vein. A small catheter is inserted, usually through a needle-stick in the skin, into the damaged vein. The catheter delivers radiofrequency energy to the vein wall causing it to heat. As the vein warms it collapses and seals. This procedure can be performed at Robert Wood Johnson University Hospital, Somerset Medical Center or St Peter's University Hospital. SclerotherapySclerotherapy (injections) can be used to treat both varicose veins and spider vein. This procedure is simple. A tiny needle is used to inject the veins with a medication that irritates the lining of the vein. Over a short time, in response to the irritation, the vein closes and is reabsorbed. The blood from the closed vein is routed to properly working veins, restorng correct circulation. Sclerotherapy reives symptoms due to varicose and spider veins in most patients. With this procedure, veins can be dealt with at an early stage, helping to prevent further complications and unsightliness.You may need one to seversl sclerotherapy sessions for any vein region and the number of injections varies per session. Generally, normal activities can be resumed after sclerotherapy. Medically prescribed support hose and/or bandages may be needed for one day to several weeks after a session to assist in resolution of the veins. 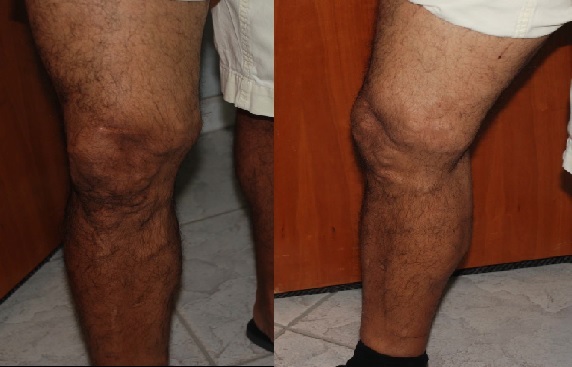 This procedure, usually performed at Deak Vein NJ Clinic, casuse minimal or no discomfort. Bruising and pigmentation may occur after the sclerotherapy. If bruising occurs, it usually disappears within one or two weeks. Although pigmentation almost always fades, it can last for several months. Scarring and other complications are rare. Ambulatory PhlebectomyAmbulatory phlebectomy is a minimally invasive surgical technique performed under local anesthesia at the Deak Vein NJ Clinic. This process involes removal of veins through tiny incisions. Incisions are so small that stitches are generally not necessary, and typically leave nearly invisible scars. Generally, ambulatory phlebectomy is preferred treatment of varicose veins.This procedure is performed at the Deak Vein NJ Clinic.